I am very excited to have been selected to participate in the San Antonio Visual Artists (SAVA) first Annual Juried Show Admiration. 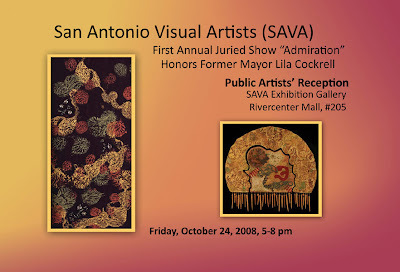 The show is being held in honor of Former San Antonio Mayor and avid art supporter Lila Cockrell. She was on hand October 18th at the private opening of the show at the Spanish Governor's Palace to hand out awards. Seeing my work along with those of painters, sculptures and mixed media artists on display in the courtyard of this historic site was quite the experience. The Public Artists' Reception is to be held on Friday, October 24th from 5-8:00 PM at the SAVA Exhibition Gallery at Rivercenter Mall. The show will continue on exhibit at the SAVA Gallery through November 21, 2008. Two of my pieces were selected for this show. The first is a 12x12" relief which is displayed upright in a rod iron stand. 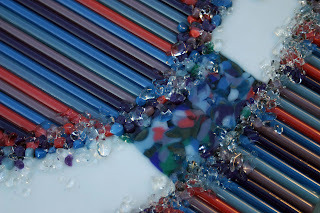 Below are photos of the glass itself. 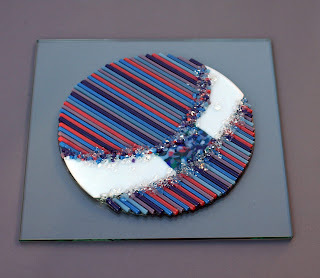 On the left the full piece as it sits on a 12x12" clear glass. On the right side a close up of the center showing the detail where the linear stripes of color meet an abrupt change with a rise of texture. 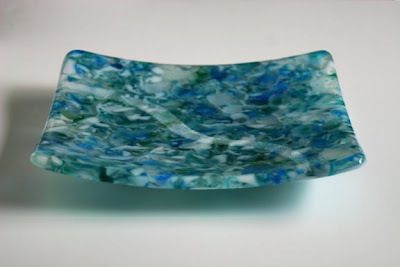 The other is one of my favorite pieces, Glacier Bay .